Chelsea kicked things off with a quick warm-up, then into spider guard drills. I've been wary of spider guard ever since Chiu told me years ago that he mashed up his fingers too much to play it regularly, but it's useful to know for teaching (and the occasional time when I need to fall back on it). Today's seminar was especially useful on that score, as Chelsea built up to the main technique gradually, with plenty of drilling. Grab their sleeves, feet in the biceps, being sure to keep their elbows flared out.You spin from side to side, extending one leg while pulling back your other knee. Do that three times, then kick your bent out and around their arm. Weave it around the inside, threading in your lasso grip. I got a bit confused on which side to extend, but fortunately this time I didn't accidentally delete all my videos after the seminar. Therefore I can double-check: when you spin to go slightly sideways, it's the inside leg that you extend, meaning your outside leg is bent. Bring your shoulders and bum off the mat as much as you can, as that will make it easier to spin. If you don't spin inwards and stay square on, they are going to be able to leg drag you. It is always the bent leg that moves into the lasso. For the first sweep, bring your straight leg back and up, past your head. That should make them step forward, enabling you to switch your grip from their sleeve to the bottom of their trouser leg (don't grip inside the cuff). Keep your foot extended into the crook of their elbow for distance, then drop that same foot to the mat, behind their opposite leg. The foot of your lassoing leg pushes into their same side leg, toes pointing towards their other hip. Chop back with your foot that's on the floor, coming up immediately after the sweep. You'll end up a little entangled in limbs, but on top. Keep hold of the trouser grip, pressing it to the mat. Otherwise, they are likely to try and get their knee in the way, making it awkward to complete your pass. Be careful of the arm you've lassoed, as coming up on top might generate some bicep-slicer pressure. It's a fast sweep, but Chelsea highlighted that the downside to that speed is that the other person can sit back up again without too much difficulty. As they do, make sure to bring your leg that was behind their leg out. That goes to their hip or stomach instead, to slow them down. On the lasso side, pull their elbow, which pops your leg through. Your other leg goes to their head, letting you transition into a triangle. 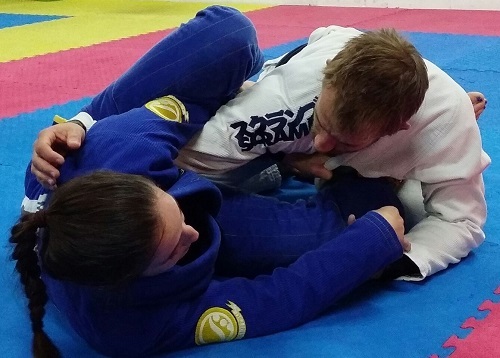 The omoplata is an option too (interestingly, Chelsea mentioned that although she's a fan of the omoplata, it is a much lower percentage submission than the triangle or armbar, but a high percentage sweep). She also added in her tip about grabbing their head and twisting it to expose their neck. They also might end up on their knees due to frustration at dealing with your lasso. If their knee is raised on the opposite side to your lasso, you can easily hook your foot underneath and sweep them. Therefore more experienced grapplers will make sure they either keep both knees down or raise it on the lasso side. If you're gripping the trouser leg, switch to grabbing their opposite collar. From here you can again go into a triangle, pushing your foot into the non-lassoed arm (or on their shoulder, if you've lost the arm), in order to then kick that leg into their neck. On the other side, pull on the lassoed elbow again to get your leg through, ready to lock up a triangle. The last spider guard option Chelsea shared with us was my favourite. For this spider guard sweep they need to have the knee raised on the lasso side. Again grab their opposite collar (although for this one, you can grab their same side collar. As you don't bring that leg through to their neck, a same-side grip won't block it). Your lasso foot hooks in behind their raised knee, moving through to de la Riva. You'll need to turn to get that de la Riva all the way in, unless you have very flexible knees. When the hook is established, it should be simple to knock them over in that direction. Chelsea then progressed to closed guard. She started with the posture break we use in our warm-up drills, flaring out their elbows and pulling your knees in. 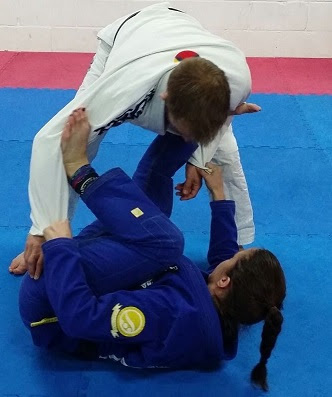 You can move into lots of closed guard variations from there (my favourite is the shoulder clamp): Chelsea began with the lapel over the back grip. Pull out their gi and pull it over their back. To give you the time to do that, anchor your other hand into their armpit. Feed the gi over their back to your hand, cinching it by their head. Switch hands, palm up. You can now go for a choke by locking in the other hand (on that gi on the other side of their head, by the shoulder, or even in the collar). Her last technique was on the overhook guard, where after breaking their posture, you overhook their arm, anchoring by grabbing their opposite collar. Shrimp out slightly towards your overhook, getting slightly on your hand. Put your foot on their hip to make some more space, then you can bring your knee on the overhook side on top of their arm. Squeeze for the pressing armbar (as ever, the tricky part is getting the right spot on their elbow). If they try to turn their arm, as long as your grip is tight enough to stop them pulling their arm right out, just twist and you can americana them. At that point, Chelsea paused the technical instruction to do a few rounds of sparring. 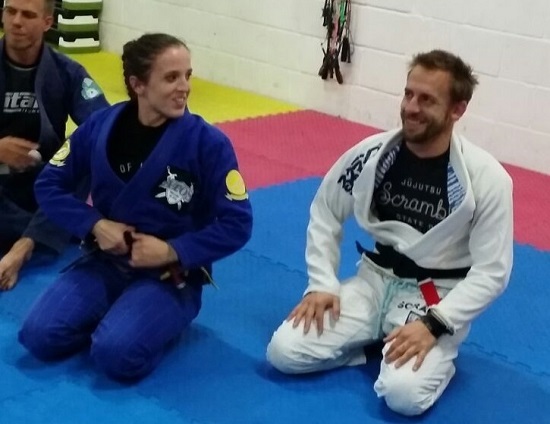 I took the opportunity to get a roll in with Tom, which mostly consisted of him hopping to either side of my open guard. It felt like my open guard was made of tissue paper, something I haven't yet been able to resolve properly. With somebody less experienced I can get a shin-on-shin in the way, or keep them at bay with my legs, but that doesn't work when your sparring partner is good (especially if they're much better than you, like black belts ;D). I asked a question about that later, during the question and answer section. The simple response was 'get grips', a useful pointer to keep in mind. I'm wondering if I focus too much on that leg on the outside, when perhaps I should attempt to really lock up the inside leg? I'll keep playing. I have a private with my instructor Kev Capel this month, so that's something I can ask about more. Chelsea then passed over to Tom, so that he could discuss his approach to passing closed guard. He goes into depth on this topic over on his website, which also has a bunch of embedded videos. Read that for the full details, but in short, you get into the usual posture with an arm by the chest and on the hip. Tom notes that the elbow of the chest arm should be angled down, as that makes it much tougher for them to collapse it. Ideally you want to grab their same side sleeve with your hip hand, meaning you can step your foot up on that side with impunity. Once you've up, stand up tall, immediately angling your knee on the sleeve grabbing side into their stomach. You want to hang them off their sleeve (or their collar, if they don't let you grab their sleeve), twisting their posture awkwardly and affecting their ability to sweep. Don't wait around there, moving to push on their other leg as quickly as you can. Pop open the guard, following their leg down with your knee so they don't have any space to start setting up an open guard.